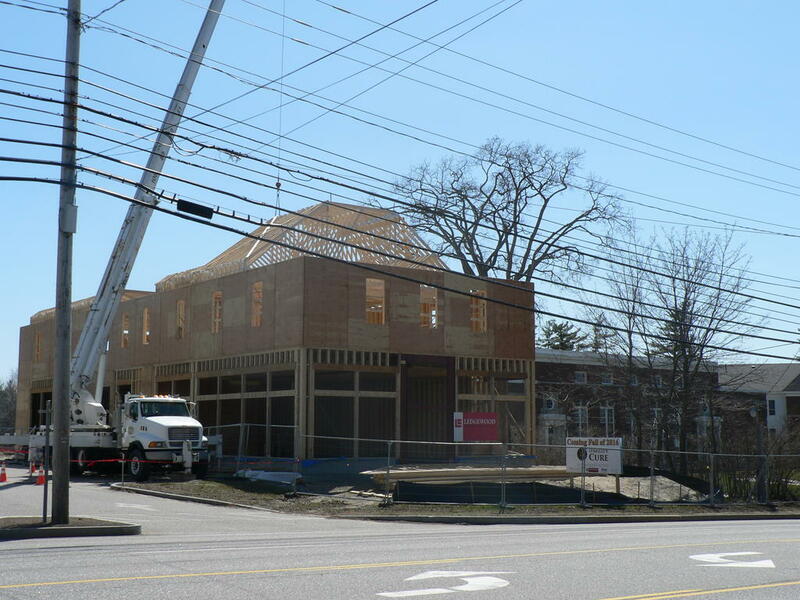 Work is proceeding at a fast clip at the construction site for the new O’Reilly’s Cure restaurant and pub, which is slated to open this fall in Scarborough’s Oak Hill neighborhood. The restaurant and pub will be owned and operated by former Town Councilor Patrick O’Reilly and his wife, Sue, who have years of experience in the hospitality industry. The restaurant is going up next to the Bessey Square commercial development, which includes a hair salon and the popular Scarborough Grounds coffee shop. O’Reilly said she and her husband are building new because after a nearly three-year process of looking at “virtually every single space, occupied or not, in the half-mile of Route 1 north and south of the Oak Hill intersection” they were unable to find the perfect spot for their new venture. O’Reilly said that once construction is complete, there will be 106 parking spaces for the 105-seat restaurant and access to the parking lot will be offered off Ward Street, which has a traffic signal. O’Reilly said that the “easy winter has allowed us to get a jump on the construction and we are now targeting an opening date of Saturday, Oct. 1.” In terms of what people can expect, she said there would be a 77-seat dining room and a 28-seat bar area. “The decor will be rustic-modern with industrial elements, warm colors and accented with wood, stone and metal. Exposed 15-foot ceilings and full wall-sized windows will (also) create a spacious look with lots of natural light,” she said. In addition, the pub will have televisions for viewing sporting events, along with a “gas fireplace (and) comfy couches offering a cozy place for drinks and light fare.” The restaurant will also offer outdoor patio seating seasonally and will also have its own gas fireplace with seating. “O’Reilly’s Cure will be a full service restaurant serving lunch and dinner seven days a week,” O’Reilly said. The menu will include American fare like rib eye steak, baked haddock and lobster macaroni and cheese, along with traditional Irish favorites such as Guinness beef stew, cottage pie and fish and chips. O’Reilly said the new restaurant would also include trendy food items like Korean barbeque beef and Asian dumplings. The pub will serve 16 different types of draft beer, featuring Guinness. “We will also feature a variety of liquors, house specialty drinks and a wine selection by the glass or bottle,” she said. In terms of size, the new building will total 4,200 square feet. The restaurant and pub will take up the first floor, while the second floor will feature professional office space for lease, O’Reilly said. Patrick O’Reilly is a Scarborough native and Sue is originally from Korea. She emigrated to the United States, and the two met while attending college together at New York University. Until about four years ago, the couple owned and operated the Pride Motel & Cottages in Dunstan for nearly two decades. Patrick O’Reilly is currently an accountant and consultant at Macpage. Follow the progress of Scarborough’s newest restaurant and pub, O’Reilly’s Cure, and give feedback on the restaurant’s Facebook page – www.facebook.com/OreillysCure/. Work is progressing on the new O’Reilly’s Cure restaurant and pub slated to open in Scarborough’s Oak Hill neighborhood this fall. The logo for the new O’Reilly’s Cure restaurant in Scarborough incorporates traditional Irish themes.